Thank You, @evan and identi.ca! Soon identi.ca will convert to pump.io. At this moment of transition, I want to thank @evan for creating the software powering identi.ca, and for running the site for the last 5 years. I joined identi.ca in October 2008 (thanks, Jon!). 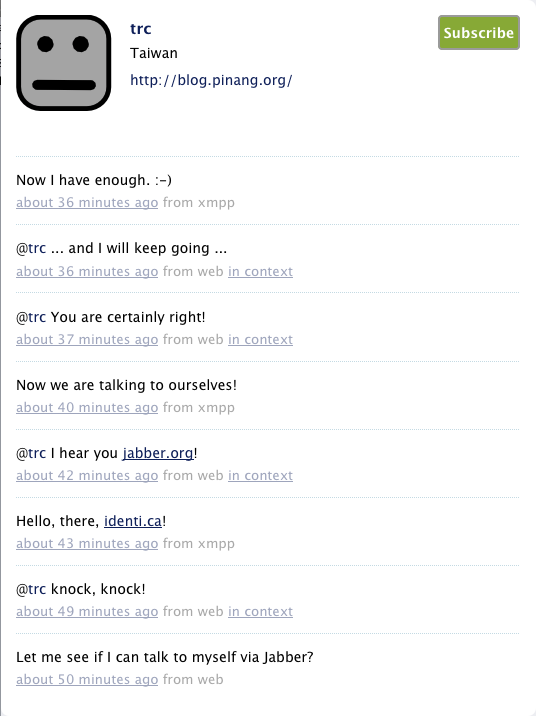 Soon I realize the people on identi.ca is an amazing bunch. I learn a lot from them, and hope I have been useful to some in some way. In identi.ca I have been learning to express myself digitally, and I thank @evan and the identi.ca community for that. Taiwanese of my generation are almost uniformally bad at communicating to others. We were brought up in an authoritative regime; the martial law in Taiwan was lifted only after I graduated from the university. Many of us were taught to keep our mouths tight when we were young. Even after growing up, I still do not communicate that much, even and in particular to family members and close friends. There was a time when speaking too much to strangers would surely get you into trouble. I knew that personally. When the time has changed, my generation still do not speak well, and do not speak much. It is within this context I started to experience identi.ca as a public media for personal expression. I like the way people have conversations in the open. I am fascinated by the broad knowledge and the pointed views in this community. I like I can speak to myself and to an unknown audience at the same time. And I read the many signals and enjoy their ambiguities. This has been an incredible experience. Thank you, @evan and identi.ca! Bassel Khartabil was detained in Syria on March 15, 2012. He remains not free to this day. Before his detention I met him twice at international conferences, and I immediately recognized him as a colleague and as an ally. If he is a stranger to you, I encourage you to learn more about him. His website bassel.ws has been offline but a snapshot was taken by the Internet Archive on Jan 6, 2012. His works are about Art, Commons, Movies, Web, and Free Culture — that is how he categorized his posts on his blog. It is truly sad that a person who is working to help ideas and information flow freely is himself imprisoned apparently for no reason. This is injustice to him and to all who work like him. Bassel must be freed, so will we. More about Bassel at Amnesty International (Taiwan). Photos about Amnesty International Taiwan's Syria Urgent Action on freeing Bassel last October. Please sign the letter at freebassel.org. Free Bassel!! 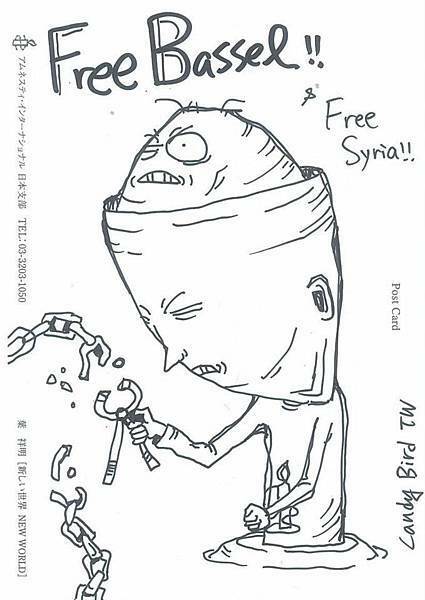 & Free Syria!! (Drawing by Candy Bird TW). We regret this entry is not available in English. CC Salon @ Mozilla Online (Beijing). I had the pleasure of being on a panel with Leonhard Dobusch, Silke Helfrich, and Kat Walsh on "CC's Role in the Global Commons Movement", moderated by Mike Linksvayer, at the CC Global Summit 2011. I did something I had not done before: I prepared a script to read. Here it is. I shall start by making a distinction between CC the organization and CC the licenses. I think this session is more about the role of Creative Commons the organization in the global commons movement. Of course, one cannot talk about CC the organization but not talking about the CC licenses. But I think it will be a useful exercise to discuss what CC the organization can still do, and shall do, when not talking about the CC licenses. CC the organization has its vision in "realizing the full potential of the Internet — universal access to research and education, full participation in culture". But CC the licenses are just for copyrightable works, so I think there is a gap between what CC-licensed contents can enable people to do and what people can really do when there is universal access to knowledge and culture. I think CC shall move forward to providing universal access to knowledge and culture, and I think this is what the global commons movement is about. My point is that there are tasks CC the organization can do and shall do for this "universal access" vision in addition to the maintenance and promotion of the CC licenses. There are three areas I would like to see CC the organization to work on. The first is about clear advocacy. The second is about content trusts. The third is about live data. Let me explain. CC the organization shall make it clear that it opposes to actions that obstruct the universal access to knowledge and culture. In particular, when people abuse the CC licenses, CC shall make it clear that it does not approve of such abuse. For example, a big company is making deals with national libraries digitizing public domain books. And these libraries agree with that big company in imposing certain restrictions to access to the digitized books. Is such a trend aligned with CC's "universal access" vision or not? Another example, a company running a photo hosting site has offered to mark a person's uploaded photos as CC-licensed, but the site also offers to remove CC license information when the person wants to switch to an exclusive licensing deal arranged by the company with a third-party about his/her photos. Isn't this an abuse of the CC licenses? As a comparison, one can look to the Free Software Foundation which not only provides the GNU General Public Licenses, but also makes timely commentaries about software freedom. They criticizes people and companies when they do things the wrong ways. They are not afraid of making enemies. (While Creative Commons seems to have many friends.) Shall CC the organization see itself as the equivalence of the Free Software Foundation in promoting the universal access to knowledge and culture, or not? We like Wikipedia and the Internet Archive. Not only their contents and services are free, we can depend on the two non-profits to always provide them for free. These are "content trusts". They are managed content collections entrusted by the contributors and users so that contents in the collections will always be free. A CC-licensed work is a single object, made free by an action from an individual. A content trust, on the other hand, is maintained by a community of people with practices of sharing. CC shall work closer with existing content trusts to further advance these practices, which certainly go behind public licensing. Here is just a thought. How about CC collaborating with "free photo" (as in "free software") community in forming a photo trust? This will help reduce the risk of CC license abuse I just mentioned which is occurring now. Further, if people establish this photo trust using CC-licensed photos from existing websites, the community also gets a very good exercise in forking (and freeing) content collections. We all know data is big today. Big data drives big business, and access to data is essential for our understanding of the world and where we are now. Some of the most interesting data is continuously produced by we the people. But we do not get to use them. Social interaction data is being collected big time and in real time. This "collective social data", in my view, is a commons. But even CC0 or the Public Domain Mark do not adequately address issues relating to access to live data. Currently most usage of live data is dictated unilaterally by terms of service (ToS), and often there is not much of quality of service (QoS) to speak of. So I think it is very important for CC to work with live or quasi-live data communities like the Open Street Map project to have a role in this new arena. Free access to and re-use of public sector information (PSI) is a similar area to look into, but I feel it is more urgent to learn from grassroots data communities about existing practices and emerging issues. Let me conclude. I think CC the organization need to play a more active role. Make timely and clear position statements, help build content trusts, and keep up with live data issues, in my view, are three areas CC shall work on in order to have an important role in the global common movement. If CC the organization only acts on maintaining and promoting the CC licenses but no much more, then one need to worry about people leaving the CC family as the organization may be seen as not working on important and emerging issues for its self-proclaimed vision. On the other hand, CC the organization has its great strength in its international network of jurisdiction project teams. These teams have been centering on the CC licenses. If CC the organization plays a more aggressive role in the commons movement, then one need to worry about what are the objectives and tasks to further align the actions of its global and diverse jurisdiction teams. These are difficult questions to ask oneself, nevertheless these questions shall now be asked. Note (2011-10-03): The session has been captured in video by the fabulous CC Poland team. This picture may not have a thousand words, but in it surely I was giving a better speech (hint: you don't want to listen to my part in the video). Thanks, Mike! The International Linked Open Data in Libraries, Archives, and Museums Summit (LOD-LAM) was held in San Francisco on June 2-3, 2011. LOD-LAM was sponsored by the Internet Archive with support from the Alfred P. Sloan Foundation, and the US National Endowment of the Humanities (Office of Digital Humanities). Participation was by invitation only; ones would need to apply first in order to attend the meeting. About 100 people participated in the summit, but few of them were from outside of Northern America and Europe. I think there were one Japanese, one Korean, and one Taiwanese. Many organizations are represented at the meeting including the US Library of Congress, British Library, Newberry Library (Library), California Digital Library, Internet Archive (Archives), the Met, Powerhouse, and Smithsonian (Museums), as well as educational institutions (e.g., MIT) and other non-profits (e.g., Creative Commons). A list of the participants is available from the event website. LOD-LAM utilized an Open Space Technology meeting format. At first the participants collaboratively created the agenda for break-out sessions, then they dispersed into parallel and focused discussions. In the first day, seven rooms were used and each one was used for three 1.5 hours sessions. That was 21 sessions. In the afternoon of the first day, there was a "dort shorts" session where each person could use two minutes to present his/her project. In the second day, the discussions continued in parallel, and the meeting ended in an "closing circle" where each participant said a few words about the meeting and/or the subject matter of LOD-LAM. The following images capture the session schedules and the dort shorts line-up. Break-out sessions (the first day). Break-out sessions (the second day). Given the many discussions undergoing at the meeting, I can only report on a few in which I participated. Because of my interest in e-publication format and RDFa, I attended the "RDFa and ePUB 3" session. My feeling is that people are not sure about whether embedding RDFa (meta)data in ePUB (hyper)text will be taken up soon by major publishers. It depends on, I think, whether the authoring tools and rendering devices will both support RDFa. (See also this blog post by Eric Hellman.) In the "Users" session, people focus on how to empower users to use and contribute to linked open data (See also this mind-map referred to in Karen Cough's post.) In the "Rights Issues" session, the participants come up with a 4-star classification-scheme for linked open cultural metadata inspired, I think, by the 5-star rating system on linked data by Tim Berners-Lee. Many nice projects were showcased at the dort shorts session in the first day. I can only list a few. The US Library of Congress now offers their name authority files for free download in addition to free online access (check this out: Lee, Teng-hui!). The British Library is providing British National Bibliography as (linked) free data services. sta.mn/n3v is a web page for every building in OpenStreetMap. Smithsonian Information hosts 7.4 million records and 570,000 digital objects. The project Linked Open Vocabularies (LOV) looks interesting and useful to me. LOD-LAM offered a rare forum for experts from leading libraries, archives, and museums to exchange experience and viewpoint about using linking open data practices for sharing and reusing cultural data online. The meeting has provided an excellent venue for people to learn from one other and, jointly, to push forward the state-of-the-art. I feel that the LOD practices in the LAM arena are progressing very quickly. For some LAM organizations, LOD clearly is here and now. For others, there remain technology and institution barriers to opening up their datasets. It may take a while for openness and linkage to become a common practice, but surely everyone is working towards such a practice now. For others' reports on LOD-LAM, please see the slides from Adrian Stevenson (UKOLN) and the notes by Laura Smart (Caltech Libraries). For a general overview on this subject, see also "How the W3C Has Come To Love Library Linked Data" which is written by Michael Kelley for the Library Journal. Note: Obligatory trip report, submitted to Academia Sinica in September 2011. Now Is A Good Time to Read! The Spring time is a not good time to read? Certainly not! Here are four recent publications which are sure to entice your reading interest. They are respectively on Creative Commons Licenses, Public Sector Information, Public Domain, and Open Access. Two are in English and two are in Chinese. Please see below their abstracts and the links to the full papers. Enjoy! Melanie Dulong de Rosnay, Creative Commons Licenses Legal Pitfalls: Incompatibilities and Solutions. Institute for Information Law, University of Amsterdam & Creative Commons Nederland. September 2010. Paul F. Uhlir, rapporteur, et al., The Socioeconomic Effects of Public Sector Information on Digital Networks. National Academies Press, USA. 2009. While governments throughout the world have different approaches to how they make their public sector information (PSI) available and the terms under which the information may be reused, there appears to be a broad recognition of the importance of digital networks and PSI to the economy and to society. However, despite the huge investments in PSI and the even larger estimated effects, surprisingly little is known about the costs and benefits of different information policies on the information society and the knowledge economy. By understanding the strengths and weaknesses of the current assessment methods and their underlying criteria, it should be possible to improve and apply such tools to help rationalize the policies and to clarify the role of the internet in disseminating PSI. This in turn can help promote the efficiency and effectiveness of PSI investments and management, and to improve their downstream economic and social results. Facing the expansion of intellectual property in the late twentieth century, supporters of public domain often viewed creative commons licenses as a private action to resist the second enclosure and build their own public domain. Lawrence Lessig, founder of creative commons, defined creative commons as an "effective public domain" that aims to realize the vision of free culture. However, some scholars and activists have criticized the fuzziness of creative commons' ideology. From their point of view, creative commons is more like a copyright license than a public domain, a submission to property discourse than a subversive resistance. In this dissertation, I explored this issue through the concepts of "discourse" and "the other" borrowed from critical studies and post-colonial theory. Specifically, I analyzed the texts of "intellectual property discourse" in a critical historical approach. In this way, we might have more insight about the relationship between creative commons and intellectual property discourse. By exploring the formation and development of intellectual property discourse in England and U.S.A., I pointed out its function in soothing the anxieties of intellectual property rights holders, who more likely be capitalists than creators, and its structural embedded contradiction. Specifically, although "original genius" as an idea image of authorship repeatedly emerges when it come to the justification of proprietor exclusive and despotic power over its private property, to be a proprietor of an "original" work only needs to be a copier with bad eyesight who is incapable of making a perfect copy. The dichotomy of "private" expression and "public" ideas also plays a same role in soothing the anxieties of intellectual property rights holders while continually expanding the scope of their rights. In addition, the other of intellectual property — public domain — becomes an synonym of knowledge wasteland and commons of tragedy in which everyone suffers. This provides a further justification for the institution of intellectual property. Under the rule of Kuomintang government before it lifted its martial law, Taiwan's Copyright registration system, in which creators need to register its work to acquire copyright, had long be an content-based speech regulation. Although we may doubted its significance in regulating speech compared to publication law, it seems that to some degree government regarded speech with a copyright "license" as a symbol of lawful speech. Instead of arguing from the perspective of free speech, lawyers, scholars and "Copyright Owners Association of Republic of China" tended to invoke intellectual property discourse. They argued that owing to the fact that copyright is a natural right, the copyright registration system unduly limited property rights secured by Constitution. In 1985 Copyright Act, Taiwanese work no longer need to registered to acquired copyright. Although intellectual property discourse played an vital role in this legal reform, it also reinforced the status of public domain of being the other. Because no one has a exclusive right over public domain, the Taiwan High Court think it is unnecessary to confirm its legal status. Furthermore, when U.S.A. demanded Kuomintang government to let their public domain movies regain copyright protection by applying new copyright act's copyright duration, the activists who against this proposal couldn't appeal to rights discourse because they had "no rights" in public domain work. In addition, from the two case studies, unauthorized books and computer programs in Taiwan, I argued there are two notable phenomenons when it comes to the resistance to of intellectual property discourse: submission in seemly resistance and resistance by acknowledging some elements of intellectual property discourse. In intellectual property discourse, the dichotomy between public domain and intellectual property also represents an evolution from barbarian to civilized, lawless to order, undeveloped to developed. In this vein, some "resistance" in Taiwan premised on this linear evolution theory, arguing the "modern" intellectual property law is too early for undeveloped and primitive Taiwan to adopt. On the other hand, owing to the fact that there are structural embedded contradiction in intellectual property discourse, we could see some lawyer and scholars who were familiar with intellectual property discourse, adopted a subversive strategy by acknowledging some elements of intellectual property discourse. Note: This entry was first posted at the Creative Commons Taiwan web site. Melanie Dulong de Rosnay, Creative Commons Licenses Legal Pitfalls: Incompatibilities and Solutions 《創用CC授權的法律缺失：不相容性以及解決方式》. Institute for Information Law, University of Amsterdam & Creative Commons Nederland. September 2010. Paul F. Uhlir, rapporteur, et al., The Socioeconomic Effects of Public Sector Information on Digital Networks 《數位網路中公部門資訊的社會經濟效益》. National Academies Press, USA. 2009. A few months ago I wrote about the Terms of Service (ToS) offered by content hosting services. I used Flickr, which is part of Yahoo!, as an example for being careful about the details in the ToS. The Yahoo! Terms of Service actually includes clauses that make it difficult to share CC-licensed photos on Flickr. (It goes without saying that Flickr does allow users to mark their photos as CC-licensed at its site; I was talking certain restrictions that come with the site's ToS). Here I wish to use Flickr again in order to illustrate the value of content aggregation, and to show how content hosting services like Flickr can leverage upon such aggregations. It is not my intention to pick on Flickr. Other content hosting services act for their own benefits as well, as will be shown later in this post. On June 16 this year, Flickr extended a deal with Getty Images, a well known stock photo agency. About two years ago, Flickr and Getty Images announced a program in which, based on individual agreements with Flickr users, Getty Images can select a user's photos into its Flickr Collection and act as the user's agent in licensing the user's photos to others. It is estimated Getty Images has added around 100,000 images to this collection by going over the Flickr site looking for licensable images. Flickr's new deal with Getty Images will allow you, a Flickr user, to add a "Request to License" button by yourself to each of your Flickr photos. Now if someone wants to license one of your photos, he or she can use the button to contact Getty Images. Getty Images will then broker a licensing deal for you. This means that Getty Images may not need to trawl the Flickr site for licensable images anymore. The "Request to License" buttons connect your photos to people who may want to license them from you. Note that all licensing deals still have to go through Getty Images as the button only informs Getty Images, not you, when it is clicked. Before the "Request to License" button will appear beneath all your photos (you cannot opt out some of them), you must first agree to license your Flickr photos exclusively via Getty Images. Whether this three-way exclusive arrangement (between Flickr and Getty Images, and between Getty Images and Flickr users) is really necessary, of course, is debatable. What about the photos you already released under CC licenses on Flickr? What happen to them if you join the Getty Images program? Good question! According to Getty Images' FAQ, "... if we do select an image that is available under a Creative Commons license, it will automatically be changed to All Rights Reserved on Flickr and from then on you must observe the exclusivity obligations ...". Flickr's FAQ on Getty Images also emphasizes, "... if you proceed with your submission, switching your license to All Rights Reserved (on Flickr) will happen automatically". I do not think what Flickr and Getty Images are doing is right for CC-licensed photos. It is not right because Creative Commons licenses are irrevocable (3.). If I release a photo under a specific CC license, say CC BY-NC, it remains so until it goes into the public domain. I can license the same photo to others under other terms (i.e., "dual-licensing" the photo), but everyone can continue to use the photo under the terms of the CC BY-NC license. Surely Flickr and Getty Images can propose to manage the rights I still reserve on my photos (e.g., commercial use of my CC BY-NC licensed photos); what they cannot do is to reverse any CC-licensed photo back to "All Rights Reserved". Flickr should just mark my CC-licensed photos as such, even if I joined Getty Images' program, and the "Request to License" buttons were added all over to my photos. For people who have copied and reused CC-licensed photos from Flickr, the act of systematic re-marking these photos as "All Rights Reserved" is even more unfriendly to these and other potential users. By erasing the photos' CC-license information, it can certainly cause confusion. For the reasons stated above, I will not consider joining Getty Images' program. Huge and diverse sets of user photos aggregate at Flickr's site. Flickr leverages on this aggregation and makes deals with Getty Images. And it is not just about photos and images. The fact that various photographers and image users gather at its site puts Flickr in an even better position to make deals: Flickr can connect for Getty Images the licensors with the licensees. For this, Flickr adds the "Request to License" functionality to its site. As Flickr is the only one who has full access to this aggregation of contents and users, it gets to decide which deals to make, how to structure the deals, hence what functionalities to add to its site. To be fair, a Flicker user must opt in to join the Getty Images program. Why am I complaining? I can just stay put and stay out of it if I don't like it. The question remains, however, on whether Flickr and its business partners will implement programs that I can like. It will be great if the Getty Images program is implemented by using CC+, a protocol for users to ask for rights beyond those already granted by a CC license. But the decision is not for me to make, and all I can do is to decline what Flickr has to offer. Flickr is not alone in acting more for its own benefits than for its users. Other content hosting services do the same. I noticed that on July 8 it was announced that the social networks giant Facebook had acquired Nextstop, a start-up operating a popular travel site mixing social networks with recommendation systems. As a result of the acquisition, the Nextstop site is shutting down on September 1; its users are offered an export tool to save their data. Although individual contributions to the social travel site can be exported, the community is gone. Originally it was planned to release the entire content at the site under a Creative Commons license. But the plan has since been abandoned. Shall Terms of Service Trump Public Licenses? The following is just my own experience and opinion. A funny thing recently happened to me: I cannot get my own photos from my Flickr account. The high-resolution files I uploaded are no longer available to me or anyone; only the smaller (resized) images are accessible. Flickr assures me, however, that "the originals are saved in case you upgrade later". Here is the story. I paid a fee to upgrade to a "Pro account" more than one year ago, but didn't renew it when my subscription expired one year later. Now Flickr keeps the originals away from me, again a "Free account" user who is not supposed to have access to the originals at the first place. Why am I surprised? Didn't Flickr spell out the difference between "Pro" and "Free" to me? I guessed they did when I upgraded, but obviously I was not paying attention to the details. I thought the difference between "Free" and "Pro" is about the amount of storage I can use, not about whether Flickr can hide my own files from me at its site. My photos at Flickr are released under the Creative Commons (CC) Licenses, which means anyone can copy and distribute them as long as the licenses are respected. Of course I hope that people use the high-resolution originals. But Flickr keeps the originals away from all people, myself included, if I don't pay Flickr again. To be fair, the resized images are still available, and CC-licensed, to all — "Pro", "Free", or not — at Flickr's site. Nevertheless I am frustrated that my effort in using the CC licenses to help distribute my (high-resolution) photos is offset by Flickr. Flickr is part of Yahoo. The Yahoo! Terms of Service (ToS) requires me to grant Yahoo, among others, a license to use the photos I upload to Flickr (9.b). Supposedly that is where I give it the right to hide my own photos from me. Moreover, the service from Flickr is provided "as is" and with no warranty of any kind (19.a). Yahoo can change its ToS anytime too (24). In short, Flickr can do many things to my photos but is under little obligation to me, if I use its service. Other content hosting services are no better, in despite that many of them help you mark your works as CC-licensed at their sites. Google's Picasaweb photo sharing service is known to mix up the CC licenses' marks with "All rights reserved" in some non-sensible manner (take a look at the licensing information about this featured photo note: this mix-up has been corrected by Google). At freesound.org and slideshare.net, you must register before you can download CC-licensed works hosted at their sites. My colleague I-Yuan doesn't like this but, as Bob argues, these service providers cannot be said to violate the terms of the CC licenses. We have agreed to their Terms of Service before files are uploaded to their sites! CC licenses are tools to help people distribute and share their works. If my photo is CC-licensed, you can copy it and pass it to others without asking me. You do not have to get the photo directly from me, and you need not download it from some designated web sites either. Once you have the photo, you can freely redistribute it, along with its license information, to anyone without the need to again ask me or anyone. This peer-to-peer nature of free distribution and redistribution is at the core of public licenses such as the Creative Commons Licenses and the GNU General Public Licenses. These public licenses enable and encourage large-scale people-to-people sharing of their works. When I rely on a particular service provider to store and distribute contents, however, its ToS imposes conditions on what can be uploaded and how they are available at its site. These conditions may not be in line with the public licenses' free circulation ideals. Here is another example. Although CC licensed works can be freely copied and distributed, they may not be sublicensed (4.a). Sublicensing complicates things; it is not necessary when public licenses are used. However, Yahoo's ToS asks me to grant it a license to use all the photos I upload. This means that I cannot upload, say, both Bob's CC BY-SA licensed photo and my retouched version to Flickr, so that their differences can be more easily compared. Unless, of course, I get Bob to grant me the right to sublicense his photo to Yahoo. But this defeats the very purpose of the CC BY-SA license, which already allows us to copy, distribute, modify, and redistribute Bob's original and our modifications (as long as the works are properly attributed and CC BY-SA licensed). Flickr, Freesound, Picasaweb, and Slideshare are some of the earliest content hosting services that adopt the CC licenses. Many of their services are provided for free, and their sites host some of the largest collections of CC-licensed works. I cannot but applaud their efforts in supporting the CC licenses. However, we shall also be aware that these free services do not come for free; their Terms of Service impose conditions on what and how our works are kept and circulated at their sites. As these services increasingly become the hubs of content circulation of our age, we need to keep our eyes on how they are shaping our sharing concepts and practices. Creative Commons Licenses are best used without other conditions, and we shall not allow Terms of Service to trump Public Licenses. By chance we took on Route 61 on the first day of the lunar year. We were visiting Fort Zeelandia, and thought it would be interesting to drive north to Taichung from there on Route 61. Route 61 is the West Seaside Expressway; some segments are not yet finished. The route goes through some "inland sea" (lagoon) and passes many small land areas developed for fish farming. There was little traffic, and the scene mostly solitary. On Route 17, looking east on a bridge to Cigu Township. Turn right and you are onto Route 61, northbound. The stalls sell sea food and oyster snack. Looking west on Route 61. Sunset on the Taiwan Strait in a hour. Very little traffic on Route 61. These road signs keep me oriented. In Budai Township, I think. "Inland Sea" (Lagoon) oyster farming. Route 61 is considered an expressway, so there are over-passes now and then. It is getting dark, and no more photo. Early this month we were on a road trip to Kenting. It is a semi-annual family trip we take in the winter break; the other in the summer. We drove south all the way to Kenting from Taipei, and stopped at Taichung, Meinong, and Kaohsiung; and on the return, at Tainan and again at Taichung. The kids had been to Kenting several times. They were less thrilled about the place. Still, Kenting continues to be a favorite of the family. As for myself, often I am in a better mood whenever going more southern than Taichung. This time it is of no exception. These photos, I hope, capture the mood of the trip. It is not the full picture, of course. (We went to two hospitals, but I am not going to write about it.) It has been a fun trip. These pictures were taken when I was not behind the wheel, mostly. The road not yet traveled: Highway 6 to Puli, then to Sun Moon Lake. Central Taiwan is a mix of agricultural and industrial scenes. Power networks crisscross road networks. Highway 3 goes through numerous tunnels. A radio tower? I cannot be sure. Almost always stop at this rest area every time I am on Highway 3. The giant banyan tree in the rest area. We stayed at Kaohsiung for two days. We went to Rueifong Night Market in the first evening. We had been to Liouhe Night Market in Kaohsiung, so I expected Rueifong to be about the same. I was wrong. The feels are quite different. I cannot say that I like one over the other. Rueifong is very compact and too crowded; Liouhe has too many Japanese tourists. It is hard to have a personal favorite about night market. My first time at Rueifong Night Market, Kaohsiung City. A very popular place, it seems. Over exposed, but I like it. The crowd, and the densely arranged stalls in the market. The next day we went to Cijin Island, once a peninsula, just outside the Port of Kaohsiung. We went through the Cross Harbor Tunnel by car; last time we took the ferry. By car, we were able to explore more about Cijin. Cargo ships lining up to enter Kaohsiung Port, as seen from Cijin Island. Every moment seems ever more relaxed at Cijin. Kenting needs no word. Here are some photos. Facing south from Nanwan Bay, Kenting. Facing east from Longpan Park, Kenting. A quite corner of Kenting; the bikers were there too. A road trip, by its nature, asks to explore roads that, until now, have not been taken. I have circled Taiwan several times by car — it is a small island after all — but are often wondering about the roads not yet taken. The southern tip of Route 1, or at least some segments of it, was new to me and proves to be very memorable for this trip. Heading north on Route 1. A "Grandma Black Pearl Wax Apple and Mango" shop. I like this view on Route 1 so much I stop my car. About to connect to Highway 3. Note: There are 30 photos about the trip in this album. Free Culture Research Workshop 2009 took place at Harvard Law School on October 23, 2009. This one-day workshop was attended by about 50 scholars and practitioners interested in emerging issues and challenges connected to "Free Culture" (as exemplified by collaborative production of culture artifacts such as Wikipedia, and the enabling technologies, legal agreements, and social norms behind them). The participants necessarily come from different disciplines — anthropology, economics, law, and information technology, among others — but have been previously engaged in research and investigation in various aspects of Free Culture. As such, this workshop provides a rare opportunity for this diverse group of people to interact and jointly reflect on their findings, to develop possible research agendas, and to facilitate collaborations. The workshop agenda, as well as the essays submitted by the participants, are available at the workshop website. The workshop was opened by welcome remarks from the Berkman Center for Internet & Society, Harvard University, and the NEXA center, Politecnico di Torino (the main sponsors of the workshop). After a brief opening by Lawrence Lessig, Jonathan Zittrain facilitated a warm-up session where the participants introduced themselves. The main part of workshop consisted of three sessions, each lasted 1½ hours. As there were a large number of participants, no podium presentation was used, instead each session proceeded by a themed discussion led by a moderator (who had read all essays related to the theme of the session). The themes for the three sessions were "Lessons from Practice" (moderated by Aaron Shaw), "Free Culture and the Marketplace" (moderated by James Grimmelmann), and "Free Culture in Society" (moderated by Nagla Rizk). A one-hour wrap-up session was moderated by Giorgos Cheliotis and Elizabeth Stark held at the end, and was followed by some summary comments from William Fisher. Given the conversational nature of the sessions, I can only recall, overly simplifying and subjective, what I still remember now of my understanding then of the discussions. The participants' essays at the workshop website are the definite sources of their viewpoints. (Note that not everyone who had submitted an essay did come to the workshop.) In the first session, the discussions are around what are Free Culture practices, and what are (shaping) the current landscapes of these practices. There is some argument for more quantitative measurements (e.g., statistics on CC license adaptations), but also about what are to be measured and how. (Do we recognize every form of Free Culture?) Issues of governance, in organizations like Creative Commons and in collaborations for culture productions, are also raised. For the "Free Culture and the Marketplace" session, I am attracted to the essays by Bodó Balázs, Judith Donath, James Grimmelmann, and Yuri Takhteyev. They explore the various "free" factors (as in cost and in expression) in people's interactions to one another, in group dynamics, and in their interfaces to relationships established by monetary transactions. My reading is that the convenient analogy between free software and free culture is not really satisfactory. In the discussion, I used a Karaoke get-together to illustrate that free culture is not about free cultural artifacts (i.e., duplicating the sound tracks), but more about uncensored cultural practices (i.e., singing with friends). I wish I had deliberated my thoughts better. The last session includes several interesting essays, e.g. by Julie Cohen, Gabriella Coleman, and Zac Zimmer, which offer legal, political, social, and even literarily critical views of freedom in the current copyright regime. The discussions, however, more or less center on whether Free Culture is a social movement, and if it is, what constitutes this movement, what it aims to change, and how. My feeling is that there is little agreement on what the Free Culture movement is (if there is one), as we have yet to fully comprehend what Free Culture is. I think it is also premature to equal what Creative Commons licenses can do with what Free Culture is about. But this is just my opinion. The participants agree, however, that more research shall be done, and ones shall ask critical research questions. One of the pleasures in participating in a research workshop like this is to meet colleagues and friends whom one does not often get to meet face-to-face. I was very happy to see Shunling Chen (SJD candidate, Harvard Law School), Mike Linksvayer (VP, Creative Commons), John Wilbanks (VP, Science Commons), and quite a few Creative Commons jurisdiction project leads at the workshop. At the morning of October 24, the day after the workshop, CC jurisdiction project leads and representatives from China Mainland, Finland, Hungary, Italy, Poland, Singapore, and Taiwan also got together with Diane Cabell (Corporate Counsel, iCommons), Mike Linksvayer, and Lawrence Lessig. We updated one another about the status of our jurisdiction projects, and even planned out some joint projects. Note: Obligatory trip report, submitted to Academia Sinica in December 2009. Related note: Jude Yew took some nice photos about the workshop. International Semantic Web Conference (ISWC) is the premier conference on semantic web research. The 8th conference in this series was held in 27th – 29th, October, 2009, at the Westfields Conference Center near Washington, DC. The main conference consists of about 80 oral presentations scheduled in 3 days, categorized into Research Track, Semantic Web In-Use Track, Doctoral Consortium Track, and Industry Track. There is also a poster session, a lightning talk session, and a Semantic Web Challenge session where new applications of semantic web datasets and technologies are showcased and entered into competition. Pat Hayes (Institute for Human and Machine Cognition), Tom Mitchell (Carnegie-Mellon University), and Nova Spivack (Radar Networks) gave three keynotes. The detailed program can be found at the ISWC 2009 conference website. In addition to the main conference, ISWC 2009 also included tutorials and workshops, held on the 25th and 26th. As this is the first time I ever attended ISWC (or any semantic web conference), I took this opportunity to learn more from the following: How to Consume Linked Data on the Web (tutorial), Legal and Social Frameworks for Sharing Data on the Web (tutorial), Building Ontology-based Applications using Pellet (tutorial), and Terra Cognita (workshop). ISWC 2009 also co-located with other meetings. Among them, I was interested in the 6th OWL Experiences and Directions Workshop (23rd – 24th), the 3rd International Conference on Web Reasoning and Rule Systems (25th – 26th), and the Semantic Web and Museum Data Workshop (25th), but did not attend any of them because of time constraint. The ISWC 2009 website has links to all tutorials, workshops, and co-located meetings. Given the many attractions in ISWC 2009, I can only say about a few that interested me. Tom Mitchell's keynote shows how ontologies (even the simple ones) help structuring information machine-mined from large collections of web pages, and how the extracted data helps refining the human-given ontologies. This model of mutual enrichment, though only on special knowledge domains and not entirely automatic, seems to work well and warrants further investigation. Erétéo, Buffa, Gandon, and Corby give a nice presentation on using semantic web technologies for the analyses of online social networks. Auer, Lehmann, and Hellmann show how to add a spatial dimension to the web of linked data by elevating information from the community built OpenStreetMap datasets. I also find Bernhard Schandl's presentation on Functions over RDF Language Elements interesting (perhaps because of my background in functional programming). One of the objectives for me to attend ISWC 2009 is to learn "in the field" about ontologies especially about how they are used, in practice, in semantic web applications. To this end, I get some understanding of this area from the following presentations: OntoCase — Automatic Ontology Enrichment Based on Ontology Design Patterns (Eva Blomqvist), What Four Million Mappings Can Tell You About Two Hundred Ontologies (Ghazvinian, Noy, Jonquet, Shah, and Musen), and Exploiting Partial Information in Taxonomy Construction (Shearer and Horrocks). My personal favorites, however, are the following three presentations: Produce and Consume Linked Data with Drupal! by Stéphane Corlosquet et. al., which also receives the best paper in the Semantic Web In-Use Track, What's New for SPARQL? which is a panel organized by the W3C SPARQL Working Group, and Linked Data and The New York Times by Evan Sandhaus. In my view, these are nice examples of the maturity of (and the need for continuous improvement to) the tools, languages, and applications of the semantic web research. Over all, ISWC 2009 is a great event to sample the state of the art in semantic web research and development. My impression is that people from different backgrounds are congregating to the semantic web area. For example, you see people working on description logic, on rule and reasoning, on ontology, on information retrieval and web mining, on linking open data on the web, and on web standardization and engineering. There is a significant presence of European research networks (e.g., DBpedia, LarKC, and NeON); one can also easily sense the intense interest from the industries (especially from the US defense industry). It has been a large crowd of interesting people. 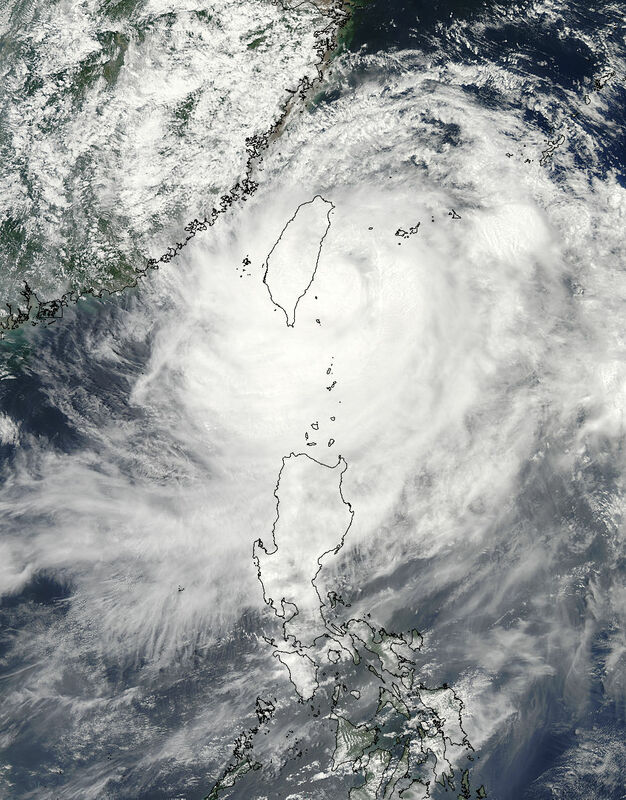 Morakot, 2009/08/07 at 05:25 UTC, when it started to bring record rainfall and heavy damage to Taiwan. Image: NASA/GSFC, MODIS Rapid Response. In the Winter of 2008, the youth of the Whale Island gang first put together their voices. With their plain and pure passion, and their believe in equity and justice, they brought out these works to show they care! Think — of all the lies in the media and politics, how would you look through the superficies and get to the truth? Feel — in your wandering and loss, and the rigidity and constraints of the system, do you see yourself? Watch — human rights ignored and by-passed, can you endure the inequities and the consequences? Rather, it is the small CC BY-NC mark at the back of the album cover that I recognize by instinct. On the cover, there are also links to Amnesty International Taiwan and the Small Place Tour events. How would human rights and copyright rights connect in this CC-licensed CD produced by Gamaa Music? The connection is that music societies in ten colleges in central and southern Taiwan, as well as many indie bands, collaborated in organizing more than 10 Small Place Tour concerts last year. Year 2008 is the 60th anniversary of the universal declaration of human rights. Amnesty International had been working with artists and musicians everywhere in giving small concerts, so as to reach out to people to care for worldwide human rights issues. This global campaign was called the Small Place Tour. These concerts and the albums were not funded by Amnesty International; they were voluntary efforts by the participating artists and musicians. By using music to promote human rights, it was hoped that the message would touch upon more people. It is by this connection that I feel especially thankful that the «Whale Island Uprising» album is released under a CC license. Creative Commons Taiwan organized the Symposium on Common Use Licensing of Publicly Funded Scientific Data and Publications at Taipei, Taiwan, on March 27, 2009. The symposium was jointly organized by CODATA Taiwan, NARL Science & Technology Policy Research and Information Center (STPI), Taiwan, and NRC Board on Research Data and Information, USA. The meeting was held in Academia Sinica, the host of Creative Commons Taiwan. The symposium program, as well as the abstracts and slides of the presentations, is available at the symposium website http://scientificdata2009.creativecommons.org.tw/programme. The one day symposium consists of three sessions and one panel. The symposium touches upon the history of and the rationale for commons use of scientific data and publications (session 1), emphasizes the current practice and trend of common use licensing (session 2), and discusses the various issues and challenges faced by the scientific communities (session 3). Joining from US at the symposium are Paul F. Uhlir from the National Academy of Sciences, Harlan J. Onsrud from University of Maine, and Kaitlin Thaney from Science Commons. Gene Hettel from the International Rice Research Institute (IRRI), the Philippines, and whom the Creative Commons Taiwan team met at the Commons Crossroads meeting at Manila in February, also joins the symposium and gives a presentation on IRRI's new Creative Commons licensing policy for its scientific publications. The Taiwanese speakers include Ted Lau (STPI), Ly-yun Chang, Kwang-Tsao Shao, and Eric Yen (all from Academia Sinica), Chau Chin Lin (Taiwan Forestry Research Institute), and Ming-Che Wu (Taiwan Livestock Research Institute). Ly-yun Chang gives an overview of the Survey Research Data Archive that has been collected and maintained at the Center for Survey Research, Academia Sinica. Shao and Lin discuss issues and challenges in sharing biodiversity data and publications, and present the Taiwan Biodiversity Information Facility. The symposium was closed by a panel, chaired by D. T. Lee (Chairman of CODATA Taiwan), on policy issues in implementing common use licensing of scientific data and publications. The panelists consist of Paul F. Uhlir, Ted Lau, Harlan J. Onsrud, and Tyng-Ruey Chuang (Creative Commons Taiwan). They exchange thoughts on policy issues and examine potential policy instruments to actively enable the sharing of scientific data and publications. Note: This entry was first posted at the Creative Commons Taiwan web site. The Chinese language text below of this entry is quite different from the English language text. Never have I considered myself to be into minimal techno, nevertheless I now make a habit of tuning in every Tuesday morning at 10:30 for ‹Bentwave›, hosted by Miss Eleanor at WNYU. By the way, that is Monday 10:30 pm in New York. Each set is full of serious fun, good for 2 ½ hours! Better yet, the programs are archived with playlists. So you know where to find and what to lean on when fighting the daily inbox! It happens that Miss Eleanor is paying a tribute to the King of Pop today. We were at Caoshan ten days ago. What a refreshing trek!